Little did I know, the American Horticultural Society headquarters is located just four miles south of Old Town Alexandria,VA. I love plants and beautifully blooming flowers but my mother was the green thumb of the family. It must have skipped a generation, but I try. 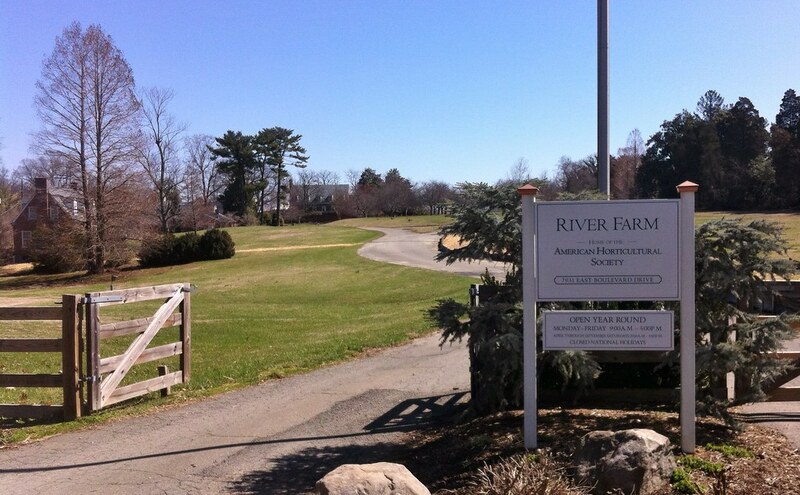 Even if you’re not a gardener, a day at the beautiful River Farm’s estate is worth the visit. The views of the Potomac River are lovely. If you want to go, the location is 7931 East Boulevard Drive, Alexandria, VA. AHS members-only morning is Friday, April 10 from 10-noon. The public sales will be Friday, April 10 from noon to 6 p.m. and Saturday, April 11 from 10 am to 6 pm. Parking is $5.00 per car. For more information go to AHS or call 703-768-5700. So nice to meet you today! I love River Farm and may have to visit during their sale and get another glimpse of Bobo’s garden. Great to meet with everyone today. I’m hoping to pick up a few “hardy” plants at River Farm ~ I’m not much of a green thumb but always willing to try. You seem able to find some really interesting places around here. I’m impressed.